In addition the school has an interdisciplinary team of professionals specializing in areas such as Medicine, Sports Medicine, Occupational Therapy, Physical Education Teachers, Psychology, Psychiatry, Special Education, Veterinary and Administration. The horse has unique muscle characteristics and who has ridden a horse has experienced its agility and harmonic motion. The horse represents for its rider a means of locomotion, represents freedom of movement, power, strength. Its symbolic meaning in the collective imagination is so strong that it is immediately associated with the idea of power and dominance. It is an essential part of an enjoyable activity that can become a real passion. 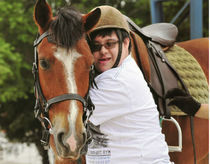 And for people with disabilities, the horse can mean not only the means to improve and progress but also the opportunity to "escape" from the disability dimension and rehabilitate in an environment rich in stimuli and completely away from the daily routines. From the moment that the main goal of rehabilitation is to acquire as much autonomy as possible, it is understandable how the Equine Rehabilitation concentrated on reducing specific alteration contributes to greater social integration by providing resources to the various issues of disabilities. The horse is an inexhaustible source of stimuli, acting at motor and sensory level as well as cognitive, educational, emotional and emotional aspects. It is one of the few comprehensive rehabilitation opportunities that exist. This is not a new therapy. Hippocrates, in ancient Greece, recommended the use of the horse because he said it regenerates the spirit and preserves the body from many diseases. During the course of history many examples are found of how the horse was used as a therapeutic tool, but only for the last 50 years, several research were made studying the beneficial effects of such therapy. European countries such as England, Germany, France and Italy were pioneers not to mention the USA who, through NARHA, have implemented a working method and standards that protect the poor. It is also important to mention that the treatment consists of precise indications and contraindications and acts in a complementary fashion with other treatments already given to the patient. 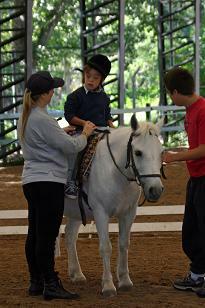 Equestrian Rehabilitation (Therapeutic Riding) and tumbling. The three phases can be part of the same process of rehabilitation or individually as a result of a clinical selection based on the different characteristics or severity of a given disease. Hippotherapy (therapy with the help of the horse), emerged in 1952 in Scandinavia, when a young athlete, Liz Hartal, who won an Olympic silver medal in Dressage, despite being hindered by having had polio. Her victory caught the attention of therapists, who in the search for new and more effective forms of therapy for mental and physical illnesses, pored over the event. The results of their study were surprising: found that the use of equestrian activities, under specific rules, is an excellent and innovative therapy that promised excellent results. From Scandinavia, equine therapy went to England and from there to the United States of America and Canada, where there are more than 500 equine centers that serve more than 35,000 riders and their families. They are mainly organized by the North American Riding for the Handicapped Association (NARHA) as well as by the National Center for Equine Facilitate Theraphy. 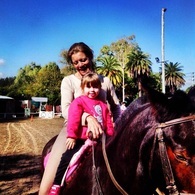 In Argentina, the Escuela de Equitación Hipocampo established an Equine Therapy Center at the Club Hípico La Horqueta and the Club Hípico Buenos Aires, where children are currently under treatment. Some of the pathologies are: Down syndrome, cerebral palsy, spina bifida, sequelae of traumatic brain injury, maturational delays, pervasive developmental disorders (autism spectrum Sme. Rett, Sme. Asperger), ADHD, among others. The horse gives the patient the opportunity to move, to enjoy pleasurable experiences while helping him/her to gain postural control and thus greater self-confidence. The overall development of the child depends on his ability to move, to explore the environment and gain sensory motor experiences. It is the horse who transmits normal movement experiences and the therapist who graduates and corrects through the handling and application of different exercises on the track. The equine environment is very stimulating and provides multiple opportunities to interact with others and actively participate in society. People suffering disabilities have few opportunities to enjoy contact with nature in week with tight schedules between clinics and therapists. The equestrian environment provides an opportunity to escape from such routines. Motivation is the key and the main point giving the concrete possibility to actively participate to the rehabilitative process. 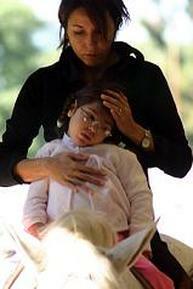 Equine Therapy Coordinator at Escuela Hipocampo.